Anyways, it’s time for Jillian! Pooling on the blue. It’s got some darker bits and on my non-alternating swatch it striped up beautifully. If only there were no increases in sweaters, it’d be fine. 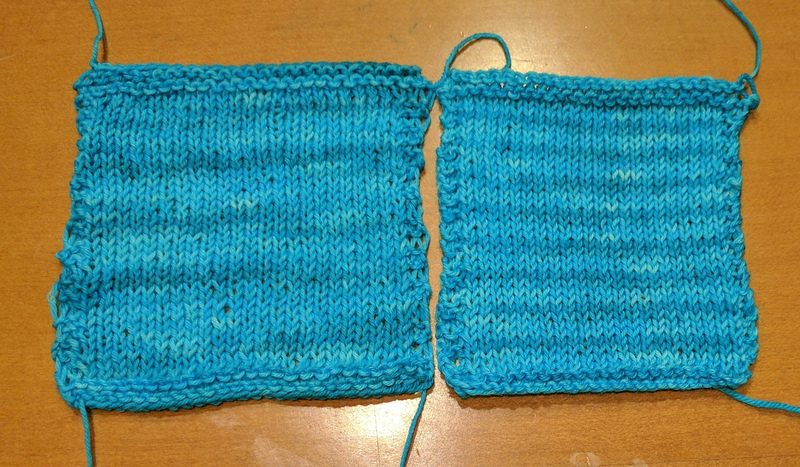 But I alternated for my US4 swatch and while there is some pooling, I think the increases will help. Weirdness with the colors – I’m going Blue/Green/Black, so hopefully having a lime green belly isn’t TOO weird. Gauge in pattern is 22 sts x 35 rows = 4″ x 4″ on US3. My US3 swatch ended up with 22 sts x 35 rows = 3.5″ x 4″. Row gauge surprisingly on-point, but stitch gauge too small. Bumped it up to US4 and ended up with the correct stitch and row gauge. So weird. The fabric is airier but very lightweight. It should make for a good spring/fall sweater, especially with the shorter sleeves.